We provide end-to-end service for your printing needs, and can help you find the best solution. We have a wide range of printing equipment and hardware, including large format printers, laminators, guillotines, trimmers and more. All the equipment we stock comes from industry leading brands and manufacturers. You need the right supplies and consumables to match your large format printer. Our range of printing supplies includes specialist print media and inks, and leading brands such as Ilford and PhotoTex. If you're looking for a particular brand, we can help. All our brands have long histories of high-quality and reliable products. We are an authorised partner and reseller for many leading brands, including Canon, Epson, and HP. No matter which industry your business is in, we have the right large format printer, equipment, or consumables for you. We provide printing hardware and consumables solutions for business in all kinds of industries. At Total Image supplies, it's our goal to provide the best customer service and advice you'll find anywhere in the industry, as well as all the best large format printers and supplies. The service is great & prices are competitive. Arrive in WA quicker than other suppliers. We've been using Total Image Solutions since we got our Canon large format printer. The service is great & prices are competitive. Arrive in WA quicker than other suppliers. Highly recommend Tyson for all large format needs. It is a pleasure to deal with people who know their products and their customers. Since we began dealing with Total Image Supplies, we have formed a close relationship with our man Kevin and the staff who are all most helpful and, best of all, knowledgeable. It is a pleasure to deal with people who know their products and their customers - and putting the two together always results in a beneficial outcome. Keep up the good work, guys. Keep up the great work, you have a customer for life in us. These guys have a great service and always a friendly voice on the phone. Tyson has helped us with everything from roll media & laminate right up to a new large format Canon printer, and he even flew up to Sydney to personally install it! I was given excellent material to help me, they did tests for me so I could make the right decision. We called Total Image Supplies as our regular supplier was out of our normal paper. Tyson was lovely to deal with and bent over backwards to help us. We got our paper about two days after we ordered it and Tyson rang to check up on the order and to make sure we would have enough stock for Christmas. Old fashioned customer service at its finest. We will definitely be continuing to deal with Total Image Supplies - super impressed. The job wouldn't have happened but for the timely and prompt service. I was called after hours to let me know that a large job would have to be reprinted equivalent to 220 binds due by 3pm. Having turned off all the computers, I had to email from home. Tyson got back to me within 15 minutes and order/delivery was organised, leaving the warehouse at 8.30 the next morning. The delivery came at 10.30 and I was able to start the binding as the job was printing without any break in proceedings. The job was finished well before time which wouldn't have happened but for the timely and very prompt service given by Total Image Supplies. Can't thanks Tyson and his team enough for all their help! Wonderful service. Very friendly and lovely staff. Great prices, highly recommended. Jess will save the day for you! Love my Canon Printer! Jess - Staff member who greets you on phone absolutely fabulous! Re stocks of Ilford Galerie Smooth Pearl Paper not being available - poor! But Jess will save the day for you! Love my Canon Printer! Wonderful service, very friendly nothing is too much trouble attitude from Tyson and his staff. Wonderful service, very friendly nothing is too much trouble attitude from Tyson and his staff. Highly recommend this company. A rare find. I buy from these guys all the time. Be like me... buy from Tyson! These guys are awesome. Always quick to get back to us and great value for money. I recently got a large canvas order for EOFY. The canvas arrived in Wollongong literally the next day from Melbourne AND it is amazing! I was a bit unsure as its so well priced (and I am VERY fussy) but thought I would try it as I have been using a different supplier for years and the canvas quality and feel is just amazing. The colour and clarity reproduction is superb! and they have 30M rolls!!! BAM! These guys are A+++ easy to deal with and great pricing too. Cant speak highly enough of them. A rare find .... I buy from these guys all the time.... I have a very successful photography business in Wollongong with six photographers now.... be like me... buy from Tyson! extremely helpful and quick delivery from Melbourne to Sydney. Much better price than anyone in Sydney.Highly recommended . Tyson was transparent with his customer service delivery & gave an outstanding support. Excellent service. Tyson was transparent with his customer service delivery & gave an outstanding support to meet the business requirements. Competitive pricing & flexible options. We are proud to list Total Image Supplies as one of our suppliers. With extensive product and industry knowledge, we can help you choose the right large format printer and supplies for your business. Tell us what you want to achieve and we will recommend the best solution. We delivery all over Australia and we do it fast. We can usually deliver a new large format printer within a week. Smaller consumables deliveries are even faster, with same day or overnight delivery available in most areas. The relationship doesn't end when we deliver your equipment. We provide ongoing support and advice for all our large format printers and supplies, including free technical support over the phone. It's all part of the service. We can handle all your printing needs, including supply and delivery of your print media, inks, and other consumables. We have reliable stocks and fast delivery, so you'll always have the supplies you need when you need them. Need advice for your printing hardware and supplies? Our team is always happy to help. Businesses have a social and moral duty to minimise their environmental impact for the benefit of future and current generations. We hope to continue moving towards a no-impact printing industry. 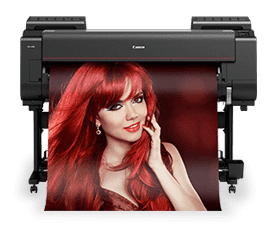 We stock the best brands for large format printers and consumable in the industry, including Canon, Epson, HP, and more. We have competitive prices for all our large format printers and consumables, so you can get the best solution at a good price. We can help you with all your printing equipment and supplies needs. Ask us any questions you've got and we'll get back to you soon.